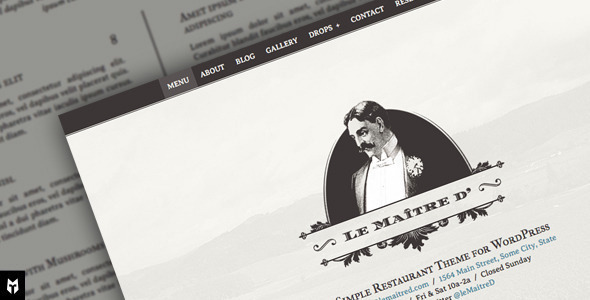 Le Maitre d’ is a menu focused WordPress theme for restaurants and cafes. This theme will let you manage everything from the WordPress dashboard so you can update your menu to add/remove items quick and easy—It’s time to ditch those online PDF menus. People hate them. Display as many widgets as you want in the footer section. * Fixed: Loading animation error. * Fixed: WordPress debug mode errors. * Fixed: menu clicking issue. * Fixed z-index issue with lightbox pop-up plugins. * Fixed Google Font API issue. * Fixed: issue with gallery icon not showing for menu items in Webkit browsers.